I am currently in the Great Smoky Mountains National Park for my second visit this month. I have been here on and off the past couple weeks, with highly intermittent Internet access. After becoming used to the lack of Instagram and email, I am enjoying being immersed in the moment in a way I rarely am at home. One of the hikes I took here was the Kephart Prong Trail. 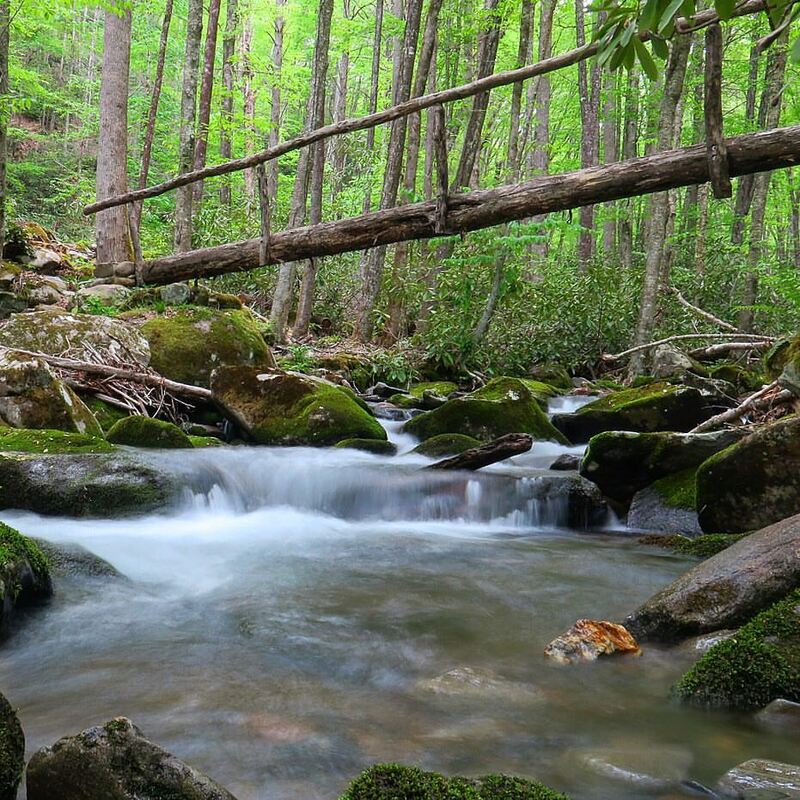 This is named for Horace Kephart, who with his colleague the photographer George Masa effectively advocated for the creation of the Smoky Mountains Park, established first with a land purchase by John D. Rockefeller and then officially as a park by Franklin Roosevelt. Just beyond the start of the trail are the remains of one of the Civilian Conservation Corps camps, and the multiple footbridges on the trail are one of the remnants of their work, with the original foundations still intact. These bridges are slippery and a bit wobbly but an amazing testament to enduring construction given the current state of our more modern crumbling bridges across the country. I’ve been to the Smokies every spring for the past four years, but usually a few weeks later in June. May seems the height of green here in the park. The young leaves glow brightly, blocking out any trace of sky above, reflected in forest pools that form where the slower flowing waters gather among the brilliant green mossy boulders. For the slow hours I hiked and photographed these verdant woods and waters, it seemed I was in a parallel universe, full of the green of new life pulsing from secret winter hiding places. I remember these bridges, well! Just finished enjoying your instagram webpage with my 10 year old gradnchild. Love you photos! and comments. Do email me and let me know what you’re up to. Maybe we can meet in Oct. at Nat. Storytelling.